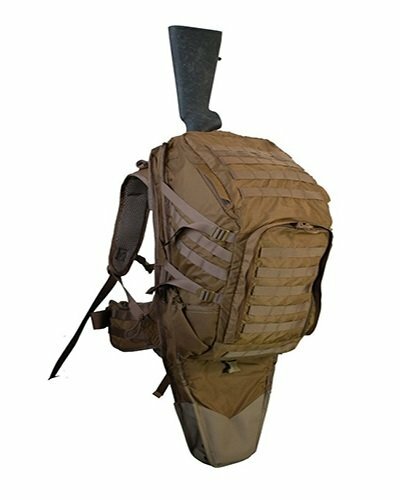 The Rocky Mountain Elk-Foundation requested Eberlestock to create a new pack. Eberlestock took up the challenge and decided to design what would be among the best and favorite hunting packs ever made. The result was the M5 Team-Elk pack, which still incorporates most of the popular features existent in the previous backpacks made by Eberlestock. The pack is proudly blazoned with Team Elk’s logo. The Eberlestock M5 Team Elk Pack’s suspension system has a fully-adjustable shooter’s harness, having a ladder system to enable you adjust it easily and vertically to fit your torso. To enhance the pack’s efficiency, the suspension system also has an adjustable sternum strap. The Eberlestock M5 Team Elk Pack boasts an exclusive Intex-tubular, aluminum-frame design that perfectly curves down, forming a meat shelf at the bottom. The back of this suspension system features a fully-padded and breathable design. Additionally, the padded waist-belt is fully removable while still having a slightly adjustable design. There are built-in pockets on the outside of this belt for your GPS, cellphone, rangefinder or any other small gear you want to have handy. This M5 Team Elk pack has a 3100 cubic-inches capacity, putting it in the mid-range of ‘honey packs’. It weighs just about 6 lbs. and 8 oz. The M5 pack comes with a Gunslinger II- style lid, with lots of MOLLE for the attachment of accessories on the top. Once you flip this lid open, you’ll have dual access to the inside: one at the top with a standard storm collar and a draw string, as well as a full-frontal access panel. You can undo the zippers and pull the backpack open to get to the whole inside. There are 4 internal sleeves on the inside: two up against its back and one on each side. There is also one mesh-zippered pocket on the front panel and a sleeve behind it. In addition, there is another long sleeve on the panel’s outside for additional storage. There is a big zippered pocket at the back, in which you can store hunting gear and accessories upfront and also on top. It has a waterproof zipper that has a padded fleece-lined pocket where you can store items such as cellphones, sunglasses and a GPS. Looking at the backpack’s side, it is closely similar to the bat wings on the Eberlestock X2 backpack. This zips down just about half way, revealing a long tubular pocket. This is perfect for holding either a spotting scope or even a hydration bladder. That is made possible by the installation of a hook inside, on which you can hang your bladder, and a port that runs the tube out to the pack’s back onto the shoulder strap. You’ll also note standard water bottle pockets on the backpack’s sides, along with more MOLLE webbing to allow for more accessory attachments. Just like the X1 pack, the M5 Team Elk pack has a new, well-designed bow carrier at the back. You can hence undo the bow pocket’s zippers and fold the outside flaps open to ensure that the bow won’t rub against the zipper teeth. You may drop your cam in your pocket in such a way that the bow will rest against the back of this pack. A strap goes around your riser, clipping in and you can easily snug it up. This Eberlestock M5 Team Elk backpack also features a built-in rifle scabbard, located in between the main pack’s body and the suspension system. This scabbard works pretty simply: just undo the zippers at the top, pull the flap over the suspension system’s back and fold the bottom of the scabbard out. You can then slip your rifle right in there. With its 3,100 cubic-inch/50 liter capacity, this pack hits the ultimate sweet spot when it comes to a hunting pack’s size. The M5 backpack provides excellent stability and comfort, thanks to its well-designed and thought out suspension system, the bottom-shelf design, body-following contours and the Intex frame. The built-in scabbard gives you the ability to retrieve weapons without having to take the pack off. It is specially designed to be quiet throughout for all-day hunting. It comes included with both front and top-loading access for enhanced convenience. There is very little to say about this backpack’s negative points. The only one we could find, though not common, is that a few users claim that the chest strap starts failing after using the pack for some time. Q: How many color options do I have when purchasing this pack? A: You can choose between two main color designs: the Hide-Open Western Slope and the Hide-Open Timber Veil. Q: What kinds of covers are installed for the bow carrier and scabbard? A: The Eberlestock M5 backpack comes designed with the azip- and – flip covers for the two compartments. This greatly helps in terms of convenience. Q: Is there any warranty package offered on the pack? A: Eberlestock offers a lifetime, yet unconditional, manufacture warranty. The Team Elk backpack bears unique features, including the grapple-compression straps, built-in bow carrier and scabbard, Intex-tubular aluminum frame and many more. By purchasing Eberlestock M5 Team Elk pack, you’ll not only have a great, versatile pack with you, but you’ll also be supporting the Rocky Mountain-Elk Foundation. Eberlestock gives part of the proceeds from each backpack to the foundation. To sum up this Eberlestock M5 Team Elk Pack review, we can’t help but agree this is a must-have pack for all hunters. Most of its users have positively reported total satisfaction, highly recommending it to others. It’s certainly great as a daypack, but would also work well as a game hauler and for short trips.